A Guild Navigator (alternately Guildsman or Steersman) is a fictional humanoid in the Dune universe created by Frank Herbert. In this series and its derivative works, starships called heighliners employ a scientific phenomenon known as the Holtzman effect to "fold space" and thereby travel great distances across the universe instantaneously. Humans mutated through the consumption of and exposure to massive amounts of the spice melange, Navigators are able to use a limited form of prescience to safely navigate interstellar space. Control of these Navigators gives the Spacing Guild its monopoly on interstellar travel and banking, making the organization a balance of power against the Padishah Emperor and the assembled noble Houses of the Landsraad. To enable their prescience, Guild Navigators not only consume large quantities of the spice, but are also continuously immersed in highly concentrated amounts of orange spice gas. This level of extreme and extended exposure causes their bodies to atrophy and mutate over time, their heads and extremities elongating, and causing them to become vaguely aquatic in appearance. The first external sign of melange-induced metabolic change is visible in the eyes, as the drug tints the sclera and iris to a dark shade of blue, called "blue-in-blue" or "the Eyes of Ibad," "a total blue so dark as to be almost black." This is a common side effect in all spice addicts. In the original 1965 novel Dune, Duke Leto Atreides notes that the Guild is "as jealous of its privacy as it is of its monopoly," and that not even their own agents ever see Navigators. Leto's son Paul wonders if they are mutated to the point of no longer appearing human. At the end of the novel, two self-identified Guild Navigators accompanying Emperor Shaddam IV are described as "fat" but not otherwise non-human. The Guild Navigator Edric, introduced in the first chapter of Dune Messiah (1969), is called a "humanoid fish," and described in his tank of spice gas as "an elongated figure, vaguely humanoid with finned feet and hugely fanned membranous hands — a fish in a strange sea." The Navigators' "elongated and repositioned limbs and organs" are noted in Heretics of Dune. In 1985's Chapterhouse: Dune, Lucilla notes that "Navigators were forever bathed in the orange gas of melange, their features often fogged by the vapors," that they possess a "tiny v of a mouth" and "ugly flap of nose" and that "Mouth and nose appeared small on a Navigator's gigantic face with its pulsing temples." She also notes that their mutated voices require translation devices, describing "the singsong ululations of the Navigator's voice with its simultaneous mechtranslation into impersonal Galach." In David Lynch's 1984 film Dune, the Navigator's mutation affects his entire body, and he resembles a giant newt or worm with a heavily deformed head, V-shaped mouth and vestigial limbs. The Navigator is not shown to have the blue-in-blue eyes of a spice addict. The 2000 miniseries Frank Herbert's Dune portrays the Navigator as a withered figure with a humanoid head, blue-in-blue eyes and arms which have mutated into wings with elongated webbed fingers. 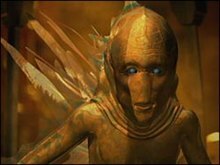 The 2003 sequel miniseries Frank Herbert's Children of Dune presents Edric as a sleek, golden humanoid with an elongated head and limbs and feathery appendages. In an unused passage by Frank Herbert from Dune Messiah published in The Road to Dune (2005), Edric is described as surviving without spice gas once a hole is opened in his tank, though his prescient abilities are practically useless in this state. Her direct physical senses were deadened, and Norma no longer cared about taste, touch, or smell ... She found it remarkable to see webbing between her fingers and toes. Her face, once blunt-featured and later flawlessly beautiful, now had a small mouth and tiny eyes surrounded by smooth folds. Her head was immense, while the rest of her body atrophied to a useless appendage. 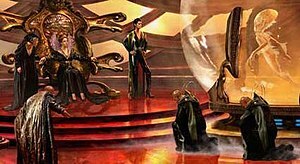 In the Brian Herbert/Anderson Prelude to Dune prequel trilogy (1999–2001), some of the previously-unexplained process of becoming a Navigator is revealed through the story of D'murr Pilru. The very first Navigator, Norma pioneers the use of melange to develop the prescience necessary to safely guide a spaceship through foldspace. In the Prelude to Dune novels, D'murr and C'tair Pilru (twin sons of Ambassador Cammar Pilru of Ix) take the initial examination to become Navigators, but only D'murr passes. From the moment he enters training, D'murr is told he will never communicate with his family again; he eventually becomes a full Navigator. In House Corrino, D'murr is piloting one of two heighliners which Hasimir Fenring uses to secretly test the synthetic melange created by the Tleilaxu in their Project Amal. The flawed spice disrupts and confuses D'murr's thoughts, feelings and prescience. He is compelled to send a telepathic message to his twin C'tair (who is hiding on Tleilaxu-conquered Ix) that his own heighliner carries rightful Ixian ruler Rhombur Vernius, on his way to free the planet. Disastrously, the first heighliner emerges from foldspace at the wrong point, striking the defensive shields of Wallach IX and plummeting into the atmosphere to its destruction. Affected by the tainted melange, D'murr misguides his ship out of the known universe and collapses. As his spice supply is replaced with real melange, D'murr senses with alarm that 'the enemy has seen us' (this is presumably the first reference to the Unknown Enemy that, millennia later, chases the Honored Matres back to the Old Empire in Heretics of Dune and threatens to destroy humanity). D'murr uses the last of his strength to return the ship safely to Junction, home of the Guild Headquarters, and dies. In 1969's Dune Messiah, a Navigator named Edric takes part in a plot against the emperor, Paul Atreides, the other conspirators being the Bene Gesserit Reverend Mother Gaius Helen Mohiam, the Tleilaxu Face Dancer Scytale, and Paul's embittered consort, Princess Irulan of House Corrino. Edric's involvement is solely to protect the conspirators from discovery by Paul's prescient sight, as the presence of a prescient such as Edric hides the activities of that person, and those around him, from other prescients. After the plot fails, Edric and Mohiam are executed in 10,207 A.G. by Fremen Naib Stilgar on orders from Paul's sister Alia Atreides. In Chapterhouse Dune (1985), a "very powerful" Navigator is described as "one of the Edrics," suggesting a possible breeding plan or use of gholas. In Hunters of Dune, the 2006 Brian Herbert/Anderson sequel to Chapterhouse Dune, the Navigator Edrik fears his kind's obsolescence when the Spacing Guild itself (pressured by a shortage of melange) begins funding the development of superior Ixian navigation technology that would not require Navigators. Seeking an alternative source of spice to break the Bene Gesserit monopoly, he meets with Uxtal, the last of the Lost Tleilaxu, hoping that he can rediscover the method of producing melange in axlotl tanks (a secret believed lost when the Bene Tleilax were destroyed by the Honored Matres). However, Uxtal is in the forced service of the Matre Superior Hellica; her price for his expertise is Edrik's help transporting a certain cargo. He agrees, delivering by heighliner the Obliterators that destroy the planet Richese, where the Bene Gesserit are mass-producing weapons and armed battleships. Uxtal is ultimately unsuccessful, but the ghola he creates of deceased Tleilaxu Master Waff later offers Edrik something better in exchange for sanctuary — the genetic knowledge for the Guild to create their own, optimized sandworms to produce melange. In Sandworms of Dune (2007), the sequel to Hunters and finale of the original Dune series, the Spacing Guild has begun replacing its Navigators with the more cost-effective Ixian navigation devices and cutting off the Navigators' supply of melange. More and more Navigators are dying from withdrawal of the spice — including Ardrae, "one of the oldest remaining Navigators" — and many defect and disappear into space rather than allow the devices on their ships. All are unaware that Face Dancer infiltrators are behind the plan, plotting their own takeover of the universe. Waff works in secret, hidden on Edrik's own heighliner, on genetically engineering his "advanced" sandworms. He accomplishes this by altering the DNA of the sandtrout stage and creating an aquatic form of the worms, which are then released into the oceans of Buzzell. Adapting to their new environment, these "seaworms" quickly flourish, eventually producing a highly concentrated form of spice, dubbed "ultraspice." Edrik and the ultraspice are later intercepted by Face Dancer leader Khrone, who seizes the valuable optimized melange. He incapacitates Edrik by damaging his tank and releasing its spice gas, soon destroying the entire heighliner to rid himself of the Navigator altogether. Apart from navigating heighliners ferrying the troops of the three Houses to Arrakis, Navigators have also been utilized by the Guild in the War of Assassins in the Emperor: Battle for Dune computer game as pilots for their NIAB Tanks (a hover tank that projects a single electrical bolt) and NIAP Flyers (an aerial version of the NIAB Tank, although without any weapons of its own). The NIAB Tank also has the ability to fold-space for short distances on the battlefield (suggesting a Holtzman generator, smaller than that of the massive heighliners). The acronyms NIAB and NIAP stand for 'Navigator in a Box' and 'Navigator in a Plane'. The Guild forces in the game can also deploy a unit called the Maker, an infantry unit somewhat resembling both a Navigator and a small sandworm, armed with an electrical weapon. ^ Frank Herbert refers to the Navigators alternately as "Guild Steersmen" beginning with Dune Messiah (1969). It may also be noted that starting in Dune (1965), Herbert uses the term "Guildsman" alternately for both Navigators and Guild agents. ^ a b c d e f Herbert, Frank (1965). Dune. ^ Herbert, Frank; Brian Herbert; Kevin J. Anderson (2005). The Road to Dune. ^ a b c Herbert, Brian; Kevin J. Anderson (2002–2004). Legends of Dune. ^ Herbert, Brian; Kevin J. Anderson (2007). Sandworms of Dune. Tor Books. p. 180. ISBN 0-7653-1293-X. ^ a b Herbert; Anderson (2007). Sandworms of Dune. ^ Herbert; Anderson (2007). Sandworms of Dune. pp. 217–218.